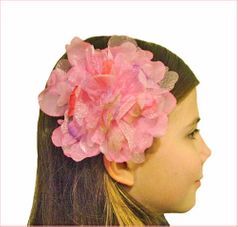 This is a beautiful multi-color hair flower for girls on alligator clip. This will match almost anything for Spring, in a melange of pinks, lavender, light green and a dash of orange, by Kids Kapers. These flowers are 5" wide.